Wow… we’re totally in production week and press night was looming! So everybody was enjoying a well deserved rest on Sunday except myself (Hawker) and Stacey (Mrs Simpson) who bolted back to London for a day for the baby shower of one lovely Sophie Burke (sensational reed player on ‘The Threepenny Opera’ from 2014), which was particularly poignant when we learned that her fabulous mum Jill Byrne was in the original film of ‘Tommy’… what a legend! So Monday began with an early call of cast recordings which was super fun… especially when people (I mention no names) whispered silly stuff into the microphone – for example “I see dead people” and the odd impromptu ‘belch’ added a certain finesse to the proceedings. (Needless to say, none of said offerings made it into the final product!) A particular highlight was when Andy (Sound Designer) politely asked myself and Shekinah (Voice of Mrs Walker) to stand away from the mic because “you’re like a pair of foghorns”… always lovely to hear! The recording was followed by a ‘clean up’ call/notes session from our MD and Director respectively. This was where Rob (MD) claimed that the harmonies to ‘Welcome’ were “weird and wonderful, just like our director”… I believe that’s a compliment Kerry! I suppose Rob should have been more prepared for Tuesday when we were rehearsing harmonies and Amy (Sally Simpson) stated “That’s my harmony, but I’ve not been singing that…I’ll sing that now!” ‘H’ for honesty Amy! Not that I can talk as I got totally busted for looking at a beauty salon flyer whilst trying to sing…it was work related, I promise…the Hawker needs to have good eyebrows! FYI I did learn that male eyebrow threading is significantly cheaper than female in Ipswich, how does that work??!! 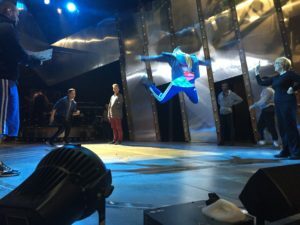 Rehearsals on stage – Lukus leaping from the aeroplane! 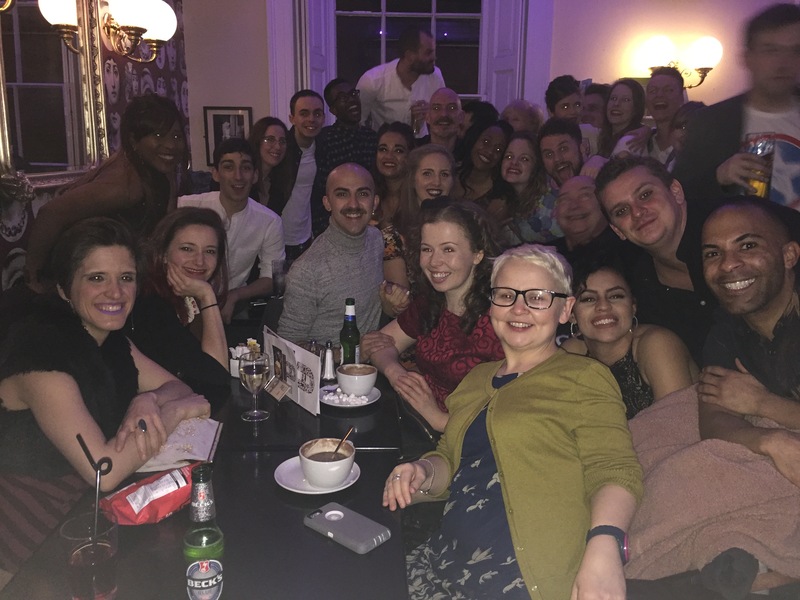 Tuesday was Press Night (Stress Night) which, all in all went pretty darn well! Despite Hearns (Dancer) doing the whole of Act 2 with his flies undone (which is probably why we received that lovely standing ovation!) Prior to this though, we were called for a cheeky rehearsal where the fantabulous Stephen (BSL Interpreter) made his acting debut standing in for the Acid Queen while Steve (Bass Guitar) was busy buying everybody Opening Night ‘Lottery Scratch Cards’, nobody won but it’s the thought that counts! 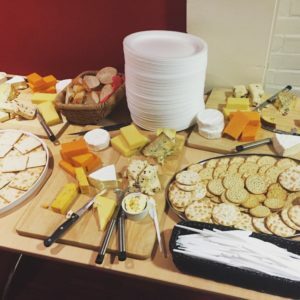 Anyway, a phenomenal show happened and we were greeted by a beautiful ‘cheese table’ at the New Wolsey (Disneyland for me!). Followed by a sneaky little party at Arlingtons in town where we stayed till about midnight – purely so that we could sing ‘Happy Birthday’ to our fab Stacey (Mrs Simpson) (I know, it’s Birthdays galore on this job!) 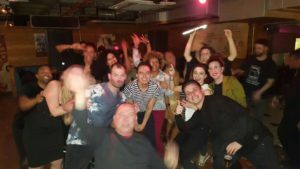 In celebration, Nickie (Asssociate Diector), Garry (Uncle Ernie) and Amy took over the dance floor to demonstrate a most spectacular wheelchair dance routine… Mark Smith (choreographer) would have been proud! Thursday saw me waking up to a little surprise gift from my Digs Cat which eased me in nicely to a chuckly day at the theatre. This began with myself, Natasha J and Peter bumping into Hearns in town who claimed that he was on his way to the gym. We then saw him 5 minutes later window shopping at Primark with a ‘Greggs’ in his hand (gym… sure!!) He then went on to steal Anthony’s (Rev Simpson) shirt for the prologue which was only made better by Dressing Room 4’s (Garry, Pickles, William & Max) discovery of the ‘fart app’… classy! Joy continued on the stage when Lukus spectacularly stacked it prior to his entrance for ‘Cousin Kevin’… this was a taste of what was yet to come for him when he ‘negotiated vertical’ during ‘Go To a the Mirror’ on Saturday dressed in his surgical scrubs! I love that guy! 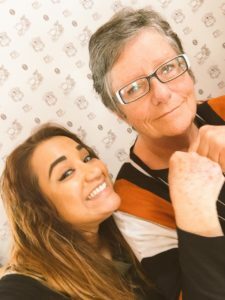 We then had a post show discussion which raised a variety of valid points including “why isn’t British Sign Language taught on the National Curriculum?” Darn good question, wouldn’t it be great if we could make that happen. Friday saw us filming for the trailer of the show in the more than capable hands of New Wolsey clever technical guru Pete Hazelwood and pals! This was where, in week 7, Hearns learned that we were playing ‘Table Football’ not ‘pinball’ in the corner! He did rectify the situation slightly by stating that ‘Sensation’ reminds him of Queen’s ‘Bohemian Rhapsody’ …TUNE! While this was occurring, Max was busy backflipping out of the aeroplane for the camera while Rob and Hearns had a step ball change race down the corridor during the interval. We are a happy bunch! So that brings us to Saturday – the Grand National! And of course we did a company sweepstake, where Lukus, Steve, Pickles and Anthony all invested heartily but sadly to no avail because the results were as follows: in 3rd place we had Kirstie (Wardrobe Supervisor) with ‘Saint Are’, in 2nd place we had Max with ‘Cause for Causes’ and in 1st place… (drum roll please Adam)… we had Giles (Stage Management) with ‘One for Arthur’. (My trusty ‘Wonderful Charm’ came in 4th – no cash for me – typical!). But quote of the week again goes to Rosie (ASM) who dryly stated “Yup, I love being a stage manager, crawling around on the floor for no reason – if my nails aren’t black by the end of the show, there’s something wrong!” Good thing were all going for a #RavishingBeauty Spa Day next week! 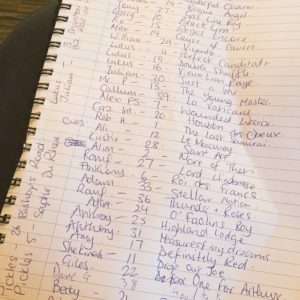 Fail of the week sadly has to go to lovely William who valiantly went home early to clean up for his Landlady who had been away for the week… she came back a day early… you do the maths! !